Portugal have a wealth of talented players - but how do each of them rank in terms of their standing in the national team? Here, we once again construct the eight best lineups Portugal can currently put together and compare them to the last analysis. Two months ago, back in October and just before Portugal's second batch of UEFA Nations League matches, we listed Portugal’s best XIs from A to H. Now, we’re doing it again, to see just how much the dynamic of the Seleção has changed in just a matter of weeks. It's very difficult to tell how Fernando Santos is thinking of lining up the team when Cristiano Ronaldo returns to the fold. Will he continue to deploy a 4-3-3 which has worked so well in recent games, will get return to the 4-4-2 formation utilised at the World Cup, or will he resort to more of a diamond shape in midfield in a 4-2-1-2 setup? Only time will tell, but above is an illustration of the players that will likely make up Santos' current best eleven, regardless of formation. No change from 2 months ago; all eleven players that featured in Portugal 'A' team back in October still in this hypothetical lineup. Patricio is undoubtedly number one between the sticks, Cancelo’s form puts him ahead of the rest at right back, a lack of competition at leftback means Mario Rui’s place as undisputed first choice is safe - for now - and Dias and Pepe at the back have nailed down a very strong centreback partnership that is largely unchallenged. Then, Neves and William Carvalho in the middle is also a virtual certainty, with a rejuvenated Renato Sanches adding the energy Santos is looking for. Bernardo Silva and Cristiano Ronaldo are virtual certainties for any big games Portugal play, and Andre Silva, for a lack of attacking competition and his general ability, is the starting striker. This list roughly constitutes the eleven players who are direct understudies to those in the A team, and would likely make any upcoming Portugal squad that is called upon by Fernando Santos. And there are a couple of notable changes to this hypothetical ‘B’ team. After recent call-ups and good performances both on the international stage and at club level, Rafa Silva moves up two places having been deemed only good enough to make the ‘D’ team two months ago. He takes the place of Atletico Madrid’s out-of-favour Gelson Martins. Another extraordinary rise in stock, which has defied all expectations, comes from another European champion, Joao Mario, who also moves up two place from the D team, taking the place of Joao Moutinho. The Inter Milan man looked as if he was set for a highly frustrating season being on the outside looking in, having publicly declared his desire to leave the club, and the Serie A, over the summer. When no move prevailed, fans were not forgiving towards his comments, and he struggled to get any sort of game time. Fast forward to now and, suddenly, he’s right in amongst it yet again, having played in four of Inter’s last 5 Serie A matches. His effort against Genoa were a particular highlight, where he bagged a goal and an outstanding 3 assists as he led his side to a 5-0 victory. In the next match, where he was benched and didn’t play a single minute, Inter subsequently lost, 4-1. That match Genoa was so good, in fact, that it single-handedly earned him a very late call-up to Fernando Santos’ very next Portugal squad, who felt that his performance was too good to be ignored. He is currently very much in the mix for being called up for any future international breaks. This Portugal C team is largely made up of the players that are just on the fringe of making the Portugal squad, though are fairly unlikely to be starting for the country any time soon. And, again, only a couple of changes from the last rankings in October, the first being Kevin Rodrigues moving up from the D team and taking the place of Fabio Coentrao. His recent call-ups for Portugal came as a bit of a surprise, but his performances were to a high standard and he looks to be the backup to both Mario Rui and Raphael Guerreiro, and, due to the injury prowess of the latter, is one of the most likely in this team to be in and around the first team going forwards. The other change in this team is Andre Gomes, whose exceptional performances for Everton have earned acclaim from fans and pundits alike. After a frustrating time at Barcelona, he seems to be getting back to his best under Marco Silva and replicating the form he showed at Valencia a few years ago. The fact he was considered the man of the match by many against Liverpool says it all, and it’s no surprise Everton fans are desperate to make his loan permanent. Several changes made to this fourth tier team, consisting of players that, right now, rely on injuries or an upsurge in personal form to get near the starting eleven, but are still very well respected players for Portugal. The one player to move up into this lineup is Nani; the Portuguese legend has been fantastic for Sporting this season since returning to the club for a third spell, and is edging closer to a place in the Portugal squad. Other than that, there are three players that have dropped down into this D team; Coentrao and Gedson Fernandes dropping down one place each, the former highly unfortunate as he has been in excellent form for Rio Ave but falling below Kevin Rodrigues, who has been playing for Portugal in recent games and is clearly valued more highly by Fernando Santos. Gedson is also well within reach of still making a Portugal squad in the near future, but is a victim of Portugal’s strength in central midfield. The other player to drop down is Joao Moutinho, who falls two places from the B team. It is difficult to say whether Portugal’s third most capped player in history will be making a return to the Portugal squad in the future; when he was first dropped, it was believed that he was simply being rested alongside Cristiano Ronaldo and Ricardo Quaresma, although he has yet to return to the squad since - as is the case with Ronaldo and Quaresma. And Fernando Santos clearly currently values other players above the Wolves man. That said, Jose Fonte was another player to lose his place in the Portugal squad after the World Cup, but he has since earned back his place after performing so admirably for French outfit Lille. It just goes to show that, as long as you are playing well, age has no limit to being involved in Santos’ Portugal. Four changes to the ‘E’ side in total, with two players taking large steps to potentialy make a Portugal squad in the future. Braga’s Ricardo Horta has been excellent so far this campaign, a crucial element in Braga managing to sustain some sort of early-season title challenge and keep within touching distance of Porto at the summit. He has so far played in each of Braga’s eleven league matches, and scoring 4 and assisting three in the process. His efforts will be crucial if Braga are to have any chance of pulling off an improbable title challenge. The other player to move up is Xeka. Probably something of an unknown name to many football fans - and possibly even to Portugal fans - Xeka has had a phenomenal campaign so far this season for Lille, playing 80 minutes or more in 15 of Lille’s sixteen Ligue 1 matches this season in that defensive midfield role, and has played an important part of Lille’s ability to maintain a scarcely believable 2nd place position in Ligue 1, putting them only behind heavyweights PSG and giving them the well-deserved tag of ‘best of the rest’. While those two move up, it’s arguable that Manuel Fernandes’ stock has taken a bit of a hit recently; in this hypothetical ranking system, he has dropped a place into the E team. He hasn’t been particularly bad this season; in fact, having played the entirety of Lokomotiv Moscow’s first 13 league matches, it’s been a respectable season for the former Everton midfielder, albeit not hitting the lofty heights of last season. But having only played 28 minutes of Lokomotiv Moscow’s last four matches, it’s been a frustrating period for Fernandes, and he’s likely quite far off regaining a place in any future Portugal squad. But the biggest drop is likely seen in Gelson Martins, who had been moved from the ‘B’ team from two months ago, to the ‘E’ team now, a huge three places down from the last article. Having barely played for Atletico Madrid this season, he has no right being near the first team, and that is reflected in this substantial drop in stock. As soon as he starts getting a bit more game time, this decline will likely be reversed. Portugal F team now, made up of players that are worthy of mention but, for one reason or another, would currently be far off the pace required of being included in any upcoming Portugal squad. The most unfortunate players here are undoubtedly Ivan Cavaleiro and Helder Costa, the latter dropping down a place in the process, as they are victims of Portugal’s great strength in depth on the wings. Another player to drop down is Palhinha, who hasn’t had as much game time at Braga as he was perhaps expecting, and should be considered below Xeka for selection in any future Portugal squads, while Toze has gone in the opposite direction, having played well for Vitoria de Guimaraes this season, helping them to 5th in the league. Wilson Eduardo wasn’t even included in the top 8 sides last time around, not even given a place in the ‘H’ team. But this time, he has been bumped into the ‘G’ side, having performed well for Braga this season. It could also display the lack of clear-cut quality Portugal have in that striker role, although Wilson would be an acceptable option to have up front. Joel Pereira also moves up the ranking, into the ‘G’ team after good performances for Setubal. Meanwhile, Tarantini moves down a place, dropping below Toze. There are lots of changes in the hypothetical Portugal ‘H’ team, which is to be expected, being the bottom team on the scale. 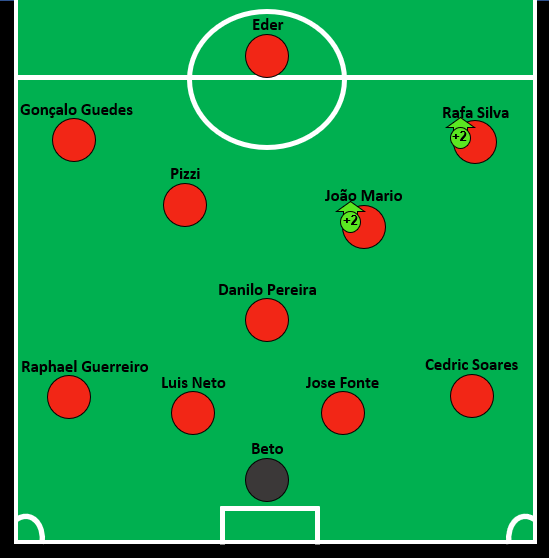 Six players are introduced into the eleven, with Braga’s Nuno Sequeira arguably Portugal’s eight best option at left back, having played all of Braga’s Primeira Liga matches this season. Miguel Lopes, who plays for Turkish outfit Akhispar Belediyespor, also merits inclusion. The experienced fullback, who turns 32 this month, has played for Portugal 4 times, and could still do a job for the national team if there was a highly improbable high-scale injury crisis. Miguel Veloso, who was a free agent for several months before rejoining Genoa, is also bumped into the H team, and is highly experienced at international level, having played for Portugal’s senior side 56 times. The front three are also all changed, Sporting’s young star Jovane Cabral introduced on the left side having continued to impress for the Lions. Cabral only recently declared his desire to play for Portugal, having already played a friendly international with his country of birth, Cape Verde, against Luxembourg. On the right, Porto’s Hernani is introduced, the 27-year old who has featured for Porto across all competitions, including the Champions League, while Vitoria Guimaraes striker Alexandre Guedes, for want of more options, joins them at the expense of Goncalo Paciencia, who has hardly featured at all for high-flying Eintracht Frankfurt this season. On the other hand, Marafona, Braga’s backup goalkeeper, drops down from the F team. Dec 7 Nelson Semedo has played with both Messi and Ronaldo - who does he think is the best of the two?